LINCOLN, Neb. — Bryant Jennings endured a rough 2015 in the ring, but really, it wasn’t a bad year at all. He lost both his fights, but he was facing perhaps the two best fighters in the division at the time: Wladimir Klitschko and Luis Ortiz. The heavyweight contender was competitive in a decision defeat to the then-RING heavyweight champion and was stopped by the Cuban in December of that year. 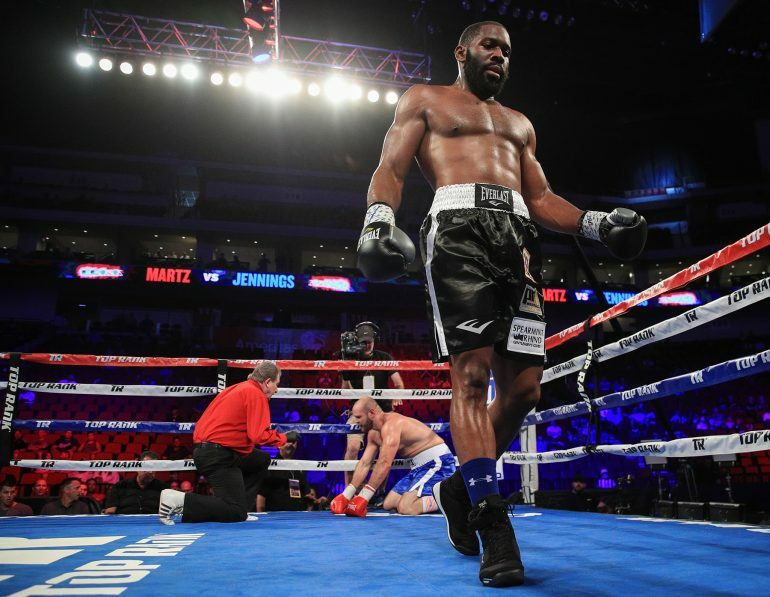 Jennings (20-2, 11 knockouts) signed with Top Rank this summer and finally returned to action Saturday against journeyman Daniel Martz, and needed just two rounds to end matters. The Philadelphian blasted Martz (15-5-1, 12 KOs) with left hooks and rights, and dropped him twice in both rounds before it was finally halted at 2:18. Top Rank hopes to match Jennings with Joseph Parker, the WBO heavyweight titleholder the company co-promoters, next year provided Jennings keeps winning and the New Zealand native beats Hughie Fury on September 23. John David Jackson, who began working as Jennings’ trainer for the Ortiz bout, would like two more fights before a title shot. “My job is to get him ready for Parker,” he said. Jennings is perhaps the best heavyweight Top Rank has promoted in quite some time. The athletic big man owns the look and will. Now he needs to put it all together after a long layoff.